Someone has beaten a Ninetales solo, but as they didn’t enter the contest, so it’s still on! The Ninetales soloer graciously allowed us to post an analysis of his raid battle on Youtube so one of you can use it to win! Check it out on our new Pokebattler Youtube channel here at https://youtu.be/P5mLgw4dtkE and subscribe for future raid analysis videos. It appears that players are getting desperate to solo Ninetales and the advice of “use a very low defense IV Pokemon” is floating around a lot on here, twitter, and on YouTube comments. While many trainers on the road know this is misinformation based off a misunderstanding of how energy gains from damage work and influence raids, many lack the resources or motivation to explain why that doesn’t work. A lot of this advice is surfacing in threads, tweets, and YouTube comments on Ninetale’s solo attempts. “Try using a low def IV Golem for more energy from damage.” That is partially true, since one half of all damage is converted into energy. 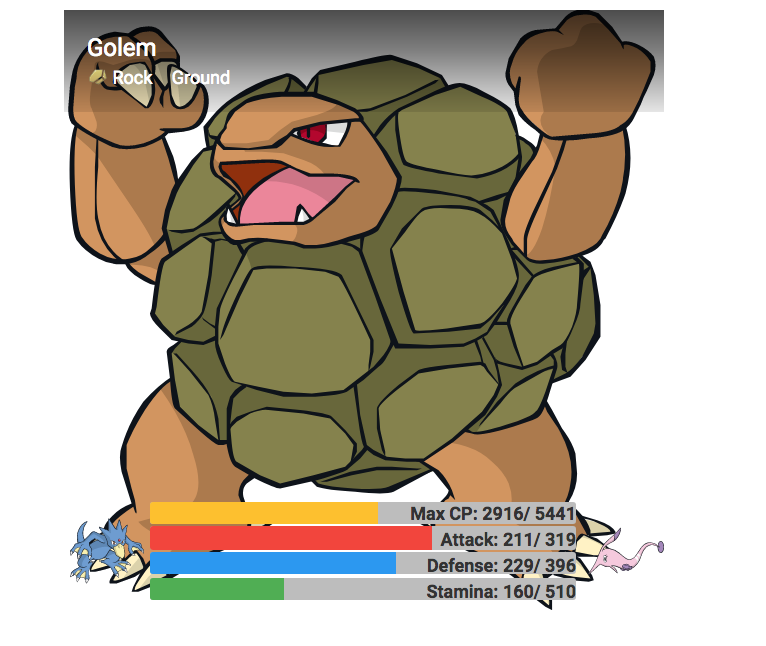 The problem is, with the Ninetale’s raid specifically, both Fire Spin and Feint attack deal the same exact damage to both 0 and 15 def IV Golem. There is no extra energy gained here. If players went forward with their advice and checked a breakpoint tool or simulations from Pokebattler, they’d realize their error. Unfortunately, since good posts only float on the road for a day at best and with the absence of a robust side bar or wiki to direct players to megathreads or tools here on the Road, it’s understandable that players have the idea of “more damage = more energy” without the resources to verify their advice. Damage influences energy gains. As stated earlier in this post, 50% of all damage is converted into energy. While that would lead you to believe that 6 damage would = 3 energy, 5 damage doesn’t = 2.5 energy. Pokemon GO loves to round, and for both damage and energy gains, it rounds up^. Looking back at the breakpoint tool you could guess that if Ninetales dealt a squeak more damage than it actually does, we could move from 5 damage per hit on Fire Spin to 6. While our advisers believe that would result in 1 more energy or maybe even 0.5 more energy for us, unfortunately the energy gains would be exactly the same. All that crossing this type of breakpoint would get us is fainting that much faster. But you must be thinking, surely this type of breakpoint could matter if it did result in 1 more energy, right? Well.. If you take enough extra damage from quick moves to gain more energy, you are only gaining a slight bonus in energy while gaining a rather large anti-bonus in your survivability. While dondon’s break point tool doesn’t feature breakpoints for charge moves, if you run simulations on Pokebattler using 15/15/15 and 15/0/15 Pokemon you’ll see that the over all result is often inconsistent and unclear. In many cases, any damage or time bonus you’re striving for with the lower defense IV is counter balanced by the time wasted in fainting and bringing in a new Pokemon, that is, if it even influences your energy gain to begin with. While there is no denying that energy gains influence damage, at what point this influence is significant is unclear. What we can observe using battle simulators however is that moves with lower DPS but higher EPS often don’t appear to perform better than moves with higher DPS but lower EPS. For example, Spark has DPS of 8.57 and EPS of 12.86. Charge Beam has DPS of 7.37 and EPS of 13.64. If you look at Magenton’s Pokebattler page you’ll find that Spark has the better rating on attack. Another thing to consider is which charge move you’re trying to feed with this strategy. If it’s a single bar charge move, then the fring energy gains you’re trying to collect will likely be lost due to fainting too soon. Aside from that, they will also likely be lost due to you overfilling the energy bar (caps at 100) because of it constantly rebounding or being read improperly by the game. However, even in the absence of these scenarios, I’d like to reiterate that the extra energy still wouldn’t matter that much. In closing, I’d like to rope back to what I stated earlier. Without linked megathreads, a robust side bar, or wiki to help guide players to information and tools on the road, and given that most “good” posts only float on the front page for a day or 2 at best, many players are only partially aware of a lot of the mechanics in Pokemon GO. I don’t really fault anyone for knowing about energy gains from damage and advising people to look into that despite all I’ve said above due to the information divides that exist in our community. I imagine many players reading this post didn’t even know that having a lower defense IV could give them fringe energy gains to begin with. If you see this type of misinformation going around, please be polite to your fellow travelers and link them to dondon’s breakpoint tool or this thread rather than flat out telling them they’re dumb and wrong. If they disagree with you? I’d say let it go. I don’t know a lot about human psychology or entrenchment, but I do know that there are people out there who believe Umbreon is a better Dark-type attacker and Psychic-type counter compared to Tyranitar and will never be persuaded otherwise. At the end of the day, no matter how right we are or how wrong someone is, getting into lengthy debates about nothing with strangers online often doesn’t get you anywhere. However, as we always say at Pokebattler, IVs don’t matter, except when they do. Here is a counterpoint to this argument by redditor /u/ct9876. Great post, and agreed on all counts. The way I look at it, whether a 15/x/15 outperforms, underperforms, or does about the same as a 15/15/15 in terms of time to win is always case specific, depending on level, breakpoints, defender stats/moves, etc. Just to give an example of when lower defense does to better, here’s one I came across when preparing my Entei 3-man lineups that some might find interesting. I noticed that Pokebattler had my 15/11/15 Vaporeon outperforming my 15/15/15 Vaporeon (both L39, WG/HP) on a few movesets, so I did some digging. It turns out that 12-15D on a L39 Vaporeon takes 8 damage from Entei’s Fire Spin. The 11D just misses the cut and takes 9 damage, hence translating into 1 extra energy gain per Fire Spin (4.5 rounded to 5). And in this case, Pokebattler sims give the 15/11/15 the edge over the 15/15/15. Against FS/OH, for example, 772.6s TTW v. 794.8s TTW.